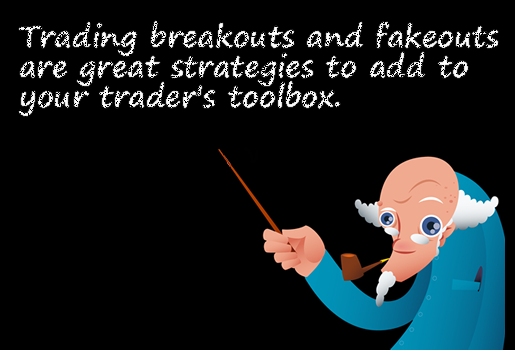 Trading breakouts and fakeouts are strategies that every trader should have in his trading toolbox! 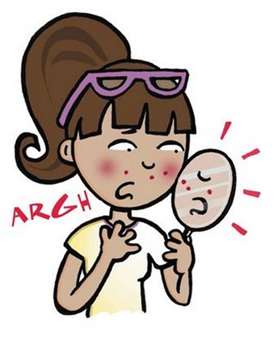 What are breakouts and how can I take advantage of them? Unlike the breakouts you might have had as a teenager, a breakout in the trading world is a little different! A breakout occurs when the price “breaks out” (get it?) of some kind of consolidation or trading range. A breakout can also occur when a specific price level is breached such as support and resistance levels, pivot points, Fibonacci levels, etc. With breakout trades, the goal is to enter the market right when the price makes a breakout and then continue to ride the trade until volatility dies down. You’ll notice that unlike trading stocks or futures, there is no way for you to see the volume of trades made in the forex market. With stock or future trades, volume is essential for making good breakout trades so not having this data available in the forex leaves us at a disadvantage. Because of this disadvantage, we have to rely not only on good risk management but also on certain criteria in order to position ourselves for a good potential breakout. If there is large price movement within a short amount of time then volatility would be considered high. On the other hand, if there is relatively little movement in a short period of time then volatility would be considered low. While it’s tempting to get in the market when it is moving faster than a speeding bullet, you will often find yourself more stressed and anxious; making bad decisions as your money goes in and then goes right back out. This high volatility is what attracts a lot of forex traders, but it’s this same volatility that kills a lot of them as well. The goal here is to use volatility to your advantage. Rather than following the herd and trying to jump in when the market is super volatile, it would be better to look for currency pairs with volatility that is very low. This way, you can position yourself and be ready for when a breakout occurs and volatility skyrockets! 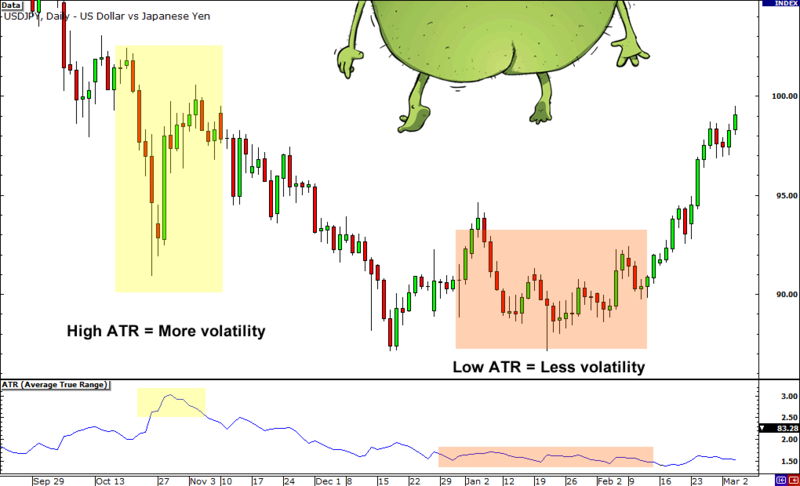 Volatility is something that we can use when looking for good breakout trade opportunities. Volatility measures the overall price fluctuations over a certain time and this information can be used to detect potential breakouts. There are a few indicators that can help you gauge a pair’s current volatility. Using these indicators can help you tremendously when looking for breakout opportunities. 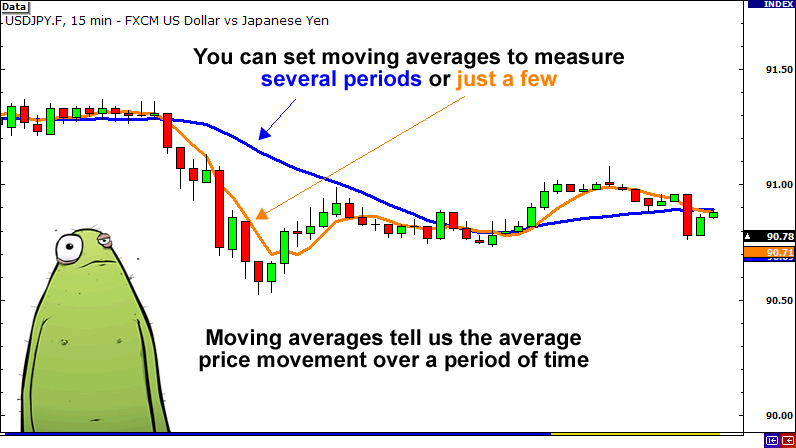 Moving averages are probably the most common indicator used by forex traders and although it is a simple tool, it provides invaluable data. Simply put, moving averages measures the average movement of the market for an X amount of time, where X is whatever you want it to be. For example, if you applied a 20 SMA to a daily chart, it would show you the average movement for the past 20 days. There are other types of moving averages such as exponential and weighted, but for the purpose of this lesson we won’t go too much in detail on them. For more information on moving averages or if you just need to refresh yourself on them, check out our lesson on moving averages. 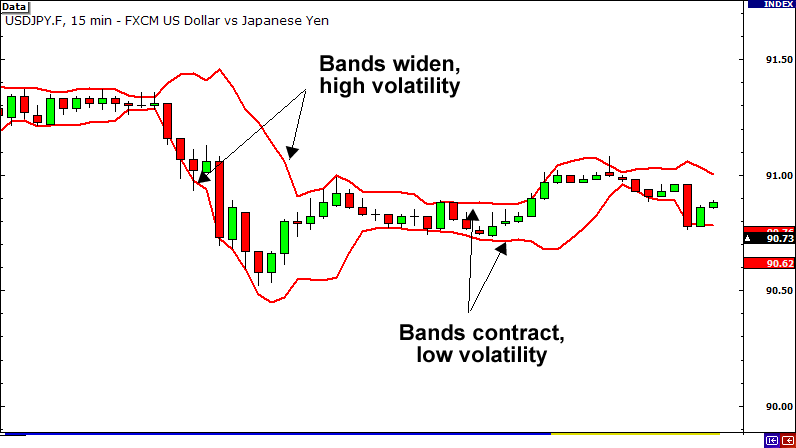 Bollinger bands are excellent tools for measuring volatility because that is exactly what it was designed to do. Bollinger bands are basically 2 lines that are plotted 2 standard deviations above and below a moving average for an X amount of time, where X is whatever you want it to be. So if we set it at 20, we would have a 20 SMA and two other lines. One line would be plotted +2 standard deviations above it and the other line would be plotted -2 standard deviations below. When the bands contract, it tells us that volatility is LOW. When the bands widen, it tells us that volatility is HIGH. 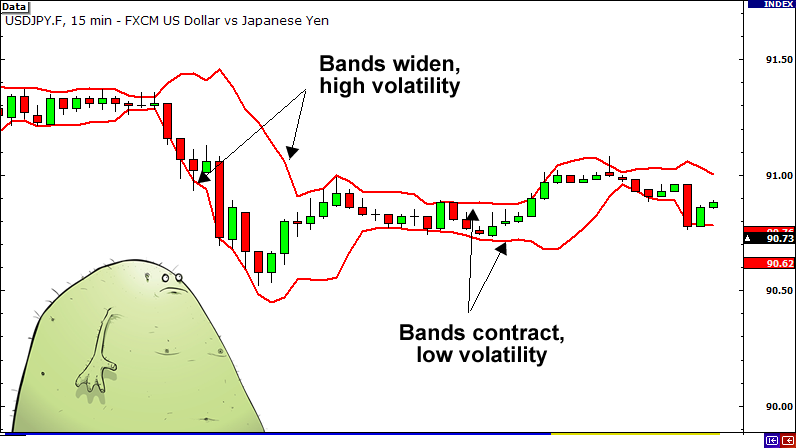 For a more thorough explanation, check out our Bollinger bands lesson. Last on the list is the Average True Range, also known as ATR. The ATR is an excellent tool for measuring volatility because it tells us the average trading range of the market for X amount of time, where X is whatever you want it to be. So if you set ATR to 20 on a daily chart, it would show you the average trading range for the past 20 days. When ATR is falling, it is an indication that volatility is decreasing. When ATR is rising, it is an indication that volatility has been on the rise. Breakout begins with eight rows of bricks, with each two rows a different color. We’re supposed to be talking about trading breakouts, not playing Breakout! Knowing what type of breakout you are seeing will help you make sense of what is actually happening in the big picture of the market. Breakouts are significant because they indicate a change in the supply and demand of the currency pair you are trading. This change in sentiment can cause extensive moves that provide excellent opportunities for you to grab some pips. Sometimes when there is an extensive move in one direction the market will often take a breather. 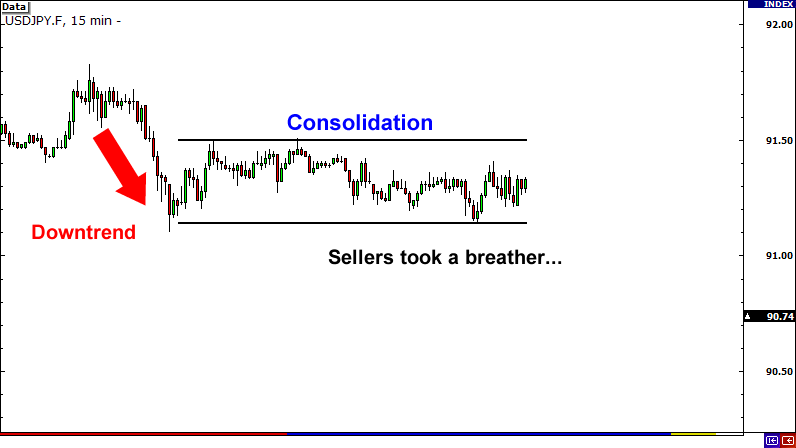 This occurs when buyers and sellers pause to see what they should do next. 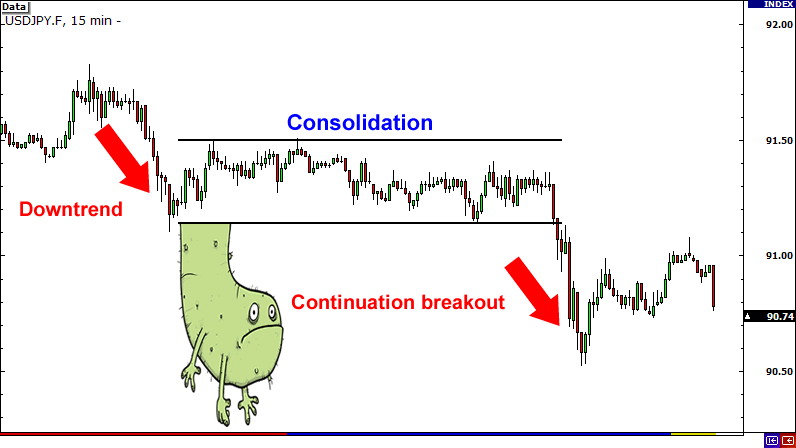 As a result, you will see a period of range-bound movement called consolidation. If traders decide that the initial trend was the right decision, and continue to push the price in the same direction, the result is a continuation breakout. Just think of it as a “continuation” of the initial trend…. You’re so smart! Reversal breakouts start off the same way as continuation breakouts in the fact that after a long trend, there tends to be a pause or consolidation. The only difference is that after this consolidation, forex traders decide that the trend is exhausted and push the price in the opposite or “reverse” direction. 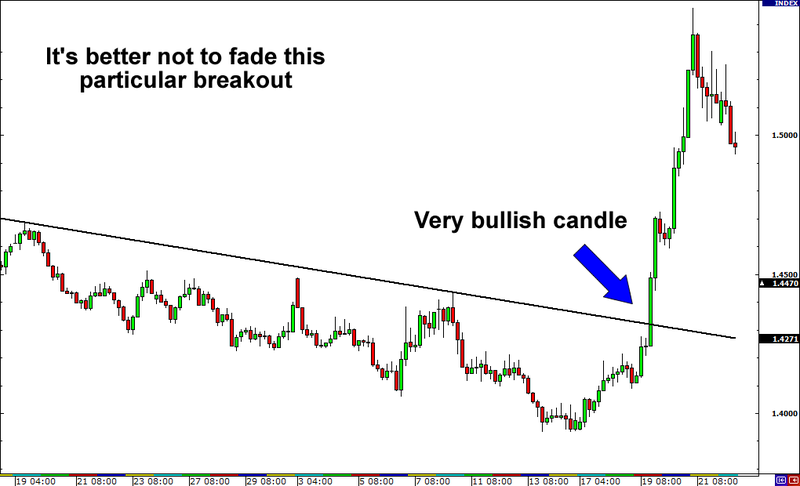 As a result, you have what is called a “reversal breakout”. You catch on quick! Now we know by now you are super excited to start trading breakouts but you also have to be careful. Just like Lionel Messi can fake out defenders, the market can fake you out as well and produce false breakouts. False breakouts occur when the price breaks past a certain level (support, resistance, triangle, trend line, etc.) but doesn’t continue to accelerate in that direction. Instead, what you might’ve seen was a short spike followed by the price moving back into its trading range. A good way to enter on a breakout is to wait until the price retraces back to the original breakout level and then wait to see if it bounces back to create a new high or low (depending on which direction you are trading). Another way to combat fake outs is by not taking the first breakout you see. By waiting to see if the price will continue to move in your intended direction, you give yourself a better chance of taking a profitable trade. The downside to this is that you may miss out on some trades in which the price moves quickly without any hesitation. Just like breakouts on your face, the nice thing about breakout trading in forex is that opportunities are pretty easy to spot with the naked eye! Unlike the former, you don’t even have to look in the mirror! Once you start getting used to the signs of breakouts, you’ll be able to spot good potential trades fairly quickly. By now you should be accustomed to looking at charts and recognizing familiar chart patterns that indicate a reversal breakout. For more information check out our lesson on chart patterns. In addition to chart patterns, there are several tools and indicators you can use to supplement your case for a reversal breakout. The first way to spot a possible breakout is to draw trend lines on a chart. To draw a trend line, you simply look at a chart and draw a line that goes with the current trend. 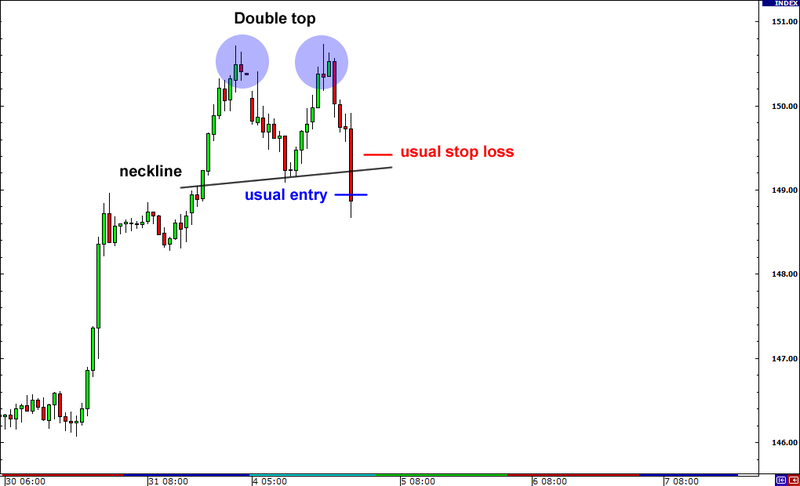 When drawing trend lines it is best if you can connect at least two tops or bottoms together. The more tops or bottoms that connect, the stronger the trend line. So how can you use trend lines to your advantage? When the price approaches your trend line, only two things can happen. The price could either bounce off the trend line and continue the trend. The price could breakout through the trend line and cause a reversal. We want to take advantage of that breakout! Looking at the price is not enough however. 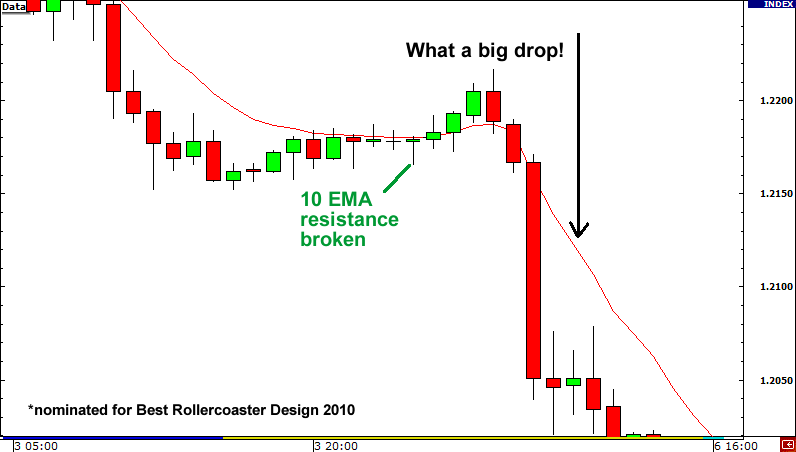 This is where using one or more of the indicators mentioned earlier in this lesson could help you tremendously. 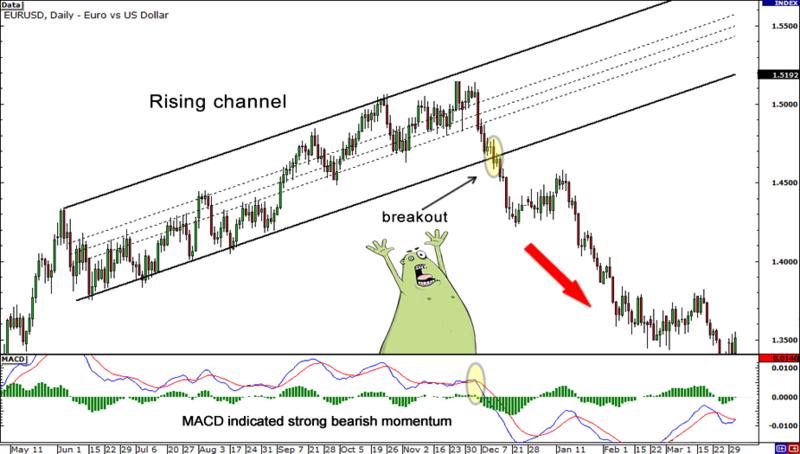 Notice that as EUR/USD broke the trend line MACD was showing bearish momentum. Using this information we can safely say that the breakout will continue to push the euro down and as traders, we should short this pair. 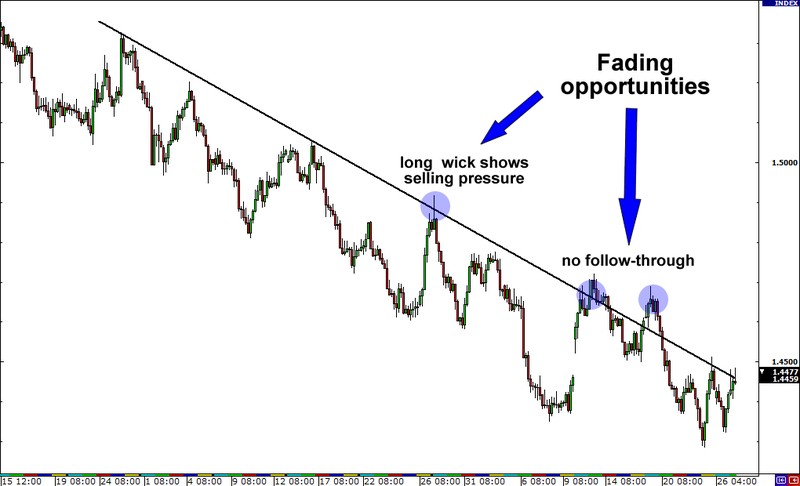 Another way to spot breakout opportunities is to draw trend channels. Drawing trend channels are almost the same as drawing trend lines except that after you draw a trend line you have to add the other side. 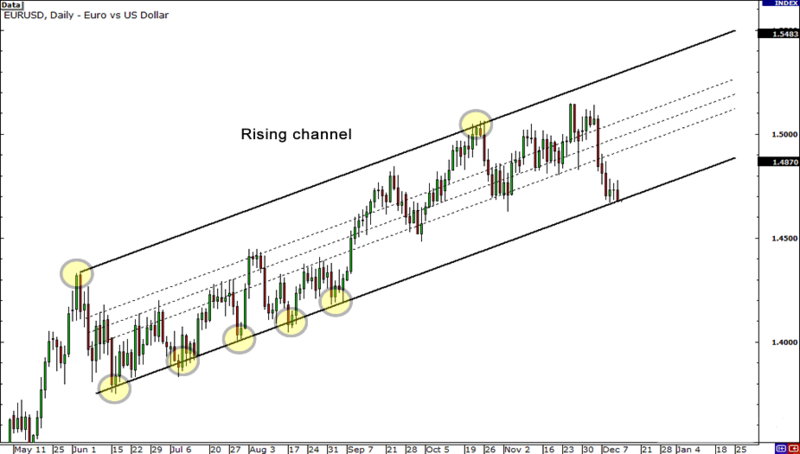 Channels are useful because you can spot breakouts on either direction of the trend. The approach is similar to how we approach trend lines in that we wait for the price to reach one of the channel lines and look at the indicators to help us make our decision. 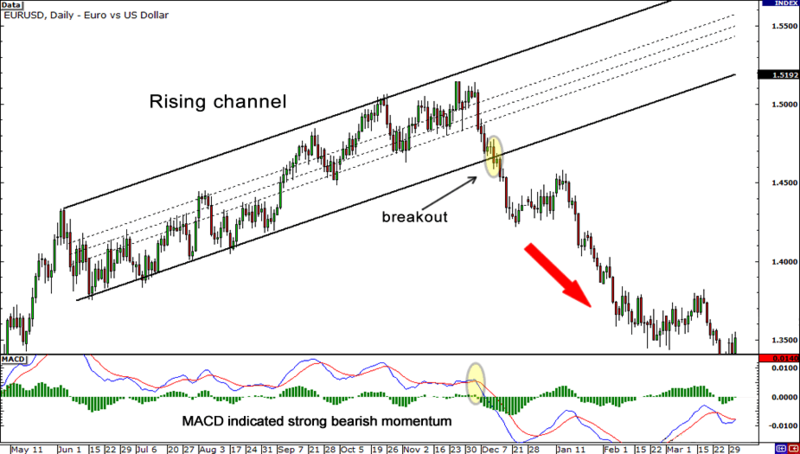 Notice that the MACD was showing strong bearish momentum as EUR/USD broke below the lower line of the trend channel. This would’ve been a good sign to go short! The third way you can spot breakout opportunities is by looking for triangles. Triangles are formed when the market price starts off volatile and begins to consolidate into a tight range. 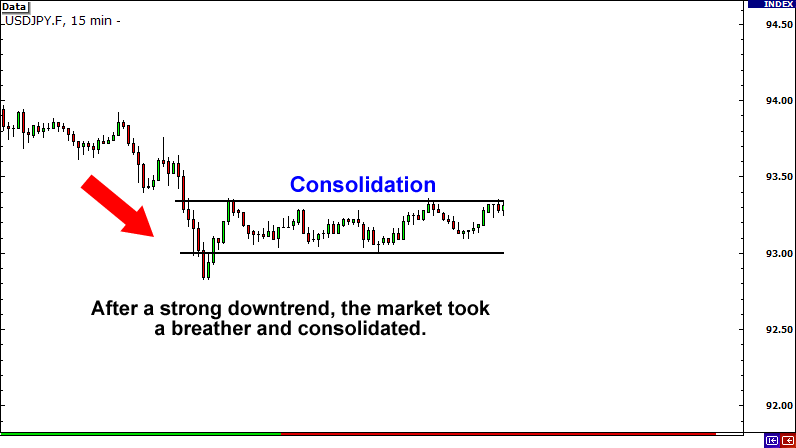 Our goal is to position ourselves when the market consolidates so that we can capture a move when a breakout occurs. Ascending triangles form when there is a resistance level and the market price continues to make higher lows. This is a sign that the bulls are slowly starting to gain momentum over the bears. The story behind an ascending triangle is that each time the price reaches a certain high, there are several traders who are convinced about selling at that level, resulting in the price dropping back down. On the other side, there are several traders who believe the price should be higher, and as the price begins to drop, buy higher than its previous low. What we are looking for is a breakout to the upside since ascending triangles are generally bullish signals. When we see a breach of the resistance level the proper decision would be to go long. Descending triangles are basically the opposite of ascending triangles. Sellers are continuing to put pressure on the buyers, and as a result, we start to see lower highs met by a strong support level. Descending triangles are generally bearish signals. To take advantage of this, our goal is to position ourselves to go short if the price should breakout below the support level. The third type of triangle is the symmetrical triangle. Rather than having a horizontal support or resistance level, both the bulls and the bears create higher lows and lower highs and form an apex somewhere in the middle. Unlike the ascending and descending triangles which are generally bullish and bearish signals, symmetrical triangles have NO directional bias. You must be ready to trade a breakout on either side! In the case of the symmetrical triangle, you want to position yourself to be ready for both an upside or downside breakout. A perfect time to use the one-cancels-the-other (OCO) order! Don’t remember what an OCO order is? Go review your types of orders! In this scenario, GBP/USD broke out on the upside and our long entry was triggered. To help you memorize the different types of triangle breakouts, just think of facial breakouts. Ascending triangles usually breakout to the upside. So when you think of ascending triangles, think of breaking out on your forehead. Descending triangles usually breakout to the downside. So when you think of descending triangles, think of breaking out on your chin. Symmetrical triangles can break either to the upside or the downside. So when you think of symmetrical triangles, think of breaking out on both your chin and forehead. Gross eh? But we bet you’ll remember it! Well… THERE IS A WAY! In fact, there are a couple of ways to tell whether or not a trend seems to be nearing its demise and a reversal breakout is in order. By now you should have a good foundation of the MACD indicator. If you don’t, you might want to check out our lesson on MACD. 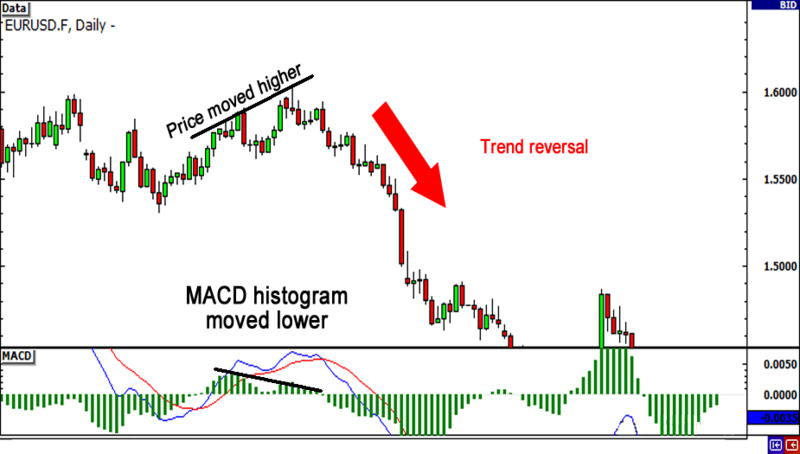 MACD is one of the most common indicators used by forex traders and for good reason. It is simple yet dependable and can help you find momentum, and in this case, the lack of momentum! MACD can be displayed in several ways but one of the “sexiest” ways is to look at it as a histogram. What this histogram does is actually show the difference between the slow and fast MACD line. When the histogram gets bigger, it means momentum is getting stronger. When the histogram gets smaller, it means momentum is getting weaker. So how can we use this when trying to spot a trend reversal? Glad you asked! Remember that trading signal we talked about earlier called divergences and how it occurs when the price and indicators move in the opposite direction? Since MACD shows us momentum. it would make sense that momentum would increase as the market makes a trend. 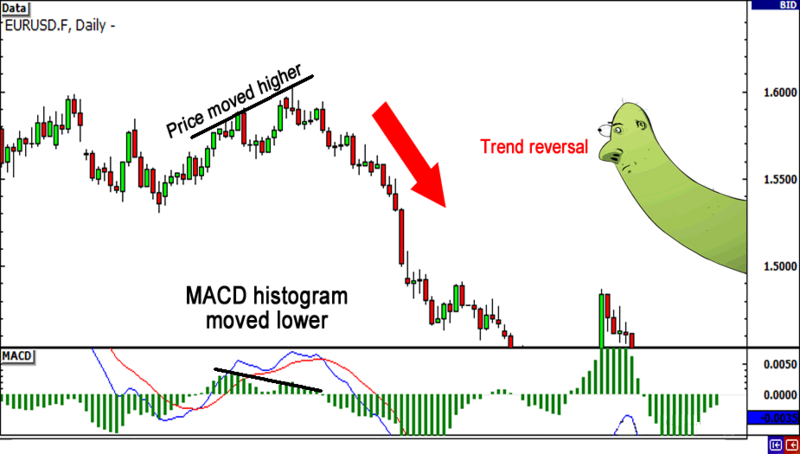 However, if MACD begins to decrease even when the trend is continuing, you can deduce that momentum is decreasing and this trend could be close to an end. You can see from the picture that as price was moving higher, MACD was getting smaller. This meant that even as the price was still trending, momentum was beginning to fade out. From this information, we can conclude that a trend reversal is highly likely. 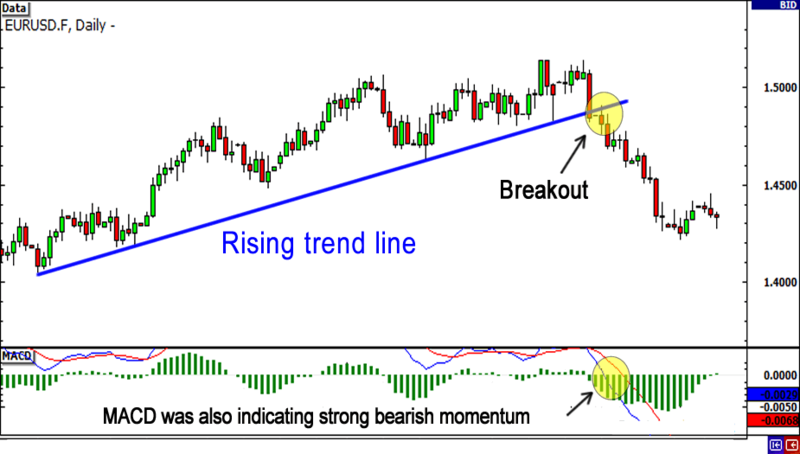 RSI is another momentum indicator that is useful for confirming reversal breakouts. Basically, this indicator tells us the changes between higher and lower closing prices for a given period of time. We won’t go into too much detail about it but if you would like to know more check out our lesson on RSI. 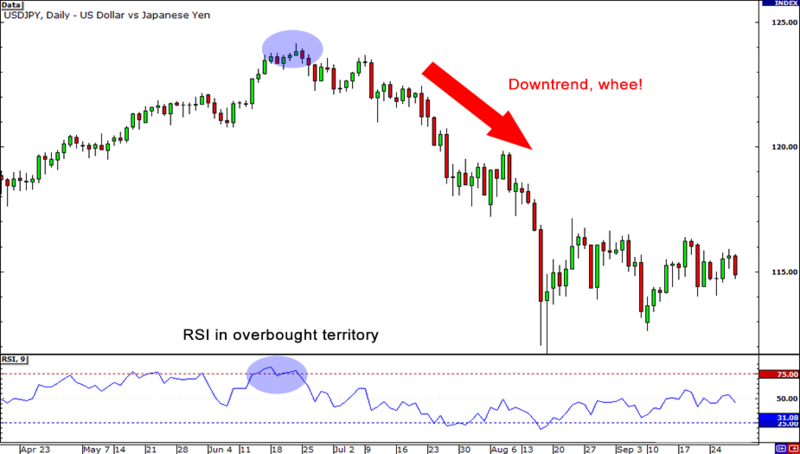 RSI can be used in a similar way to MACD in that it also produces divergences. By spotting these divergences, you can find possible trend reversals. However, RSI is also good for seeing how long a trend has been overbought or oversold. A common indication of whether a market is overbought is if the RSI is above 70. On the flipside, a common indication of whether a market is oversold is if the RSI is below 30. 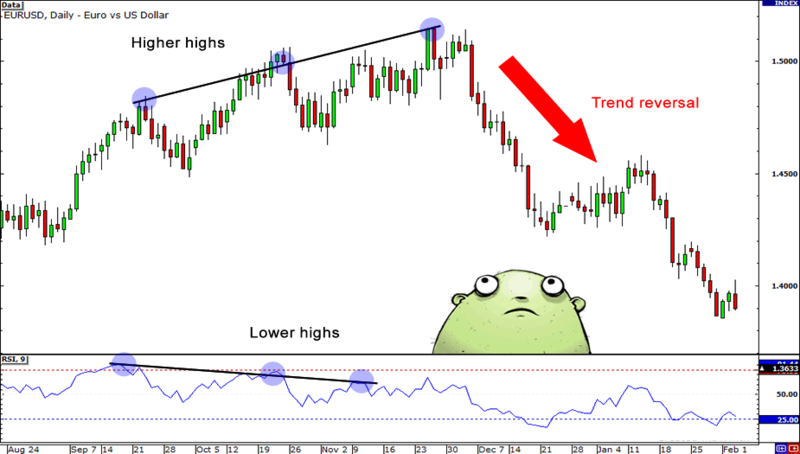 Because trends are movements in the same direction for an extended period of time, you will often see RSI move into overbought/oversold territory, depending on the direction of the trend. 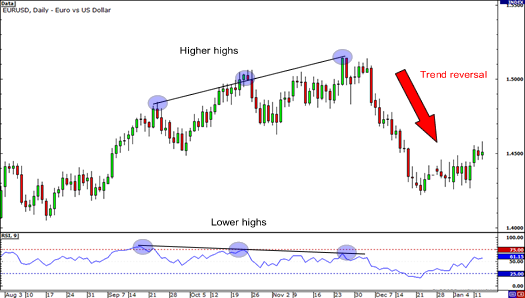 If a trend has produced oversold or overbought readings for an extended period of time and begins to move back within the range of the RSI, it is a good indication that the trend may be reversing. In the same example as before, the RSI showed that the market was overbought for a billion days (ok not that long). Once RSI moved back below 70, it was good indication that the trend was about to reverse. Breakouts are popular among forex traders. When price finally “breaks” out of that support or resistance level, one would expect price to keep moving in the same direction of the break. There must have been enough momentum building up in order for price to have broken out of the level, right? Wait for it… Just a few more moments… To see price inch one direction… Then suddenly move miles in the opposite direction! Huh?!? What the heck?! What happened to “the bread and butter and the end of world hunger” strategy? End of story: You are left eating ketchup packets and crackers like Tom Hanks in The Terminal. One thing you should remember to note about support and resistance levels is that they are areas in which a predictable price response can be expected. Support levels are areas where buying pressure is just enough to overcome selling pressure and halt or reverse a downtrend. A strong support level is more likely to hold up even if price breaks the support level and it provides traders a good buying opportunity. Resistance levels are just like support levels but work in the opposite way. They tend to halt or even reverse uptrends. Resistance levels are areas in which selling pressure is just enough to overcome buying pressure and force price back down. Strong resistance levels are more like to hold up even if price temporarily breaks the resistance level and it provides traders a good selling opportunity. In the next section, we will dive deeper into fakeouts and discuss why we should trade them and how to profit off them. It’s not enough learning about breakout strategies because there will be times that breakouts FAIL. We have to know what to do in case of fakeouts. This is part of your Jedi forex training. To be a Jedi master, you must be able to master fakeouts. Fade the breakout you say? Was that just a typo? Did you mean to say, “trade the breakout”? Fading breakouts simply means trading in the opposite direction of the breakout. Fading breakouts = trading FALSE breakouts. You would fade a breakout if you believe that a breakout from a support or resistance level is false and unable to keep moving in the same direction. In cases in which the support or resistance level broken is significant, fading breakouts may prove to be smarter than trading the breakout. Keep in mind that fading breakouts is a great short-term strategy. Breakouts tend to fail at the first few attempts but may succeed eventually. REPEAT: Fading breakouts is a great short-term strategy. It is NOT a great one to use for longer term traders. 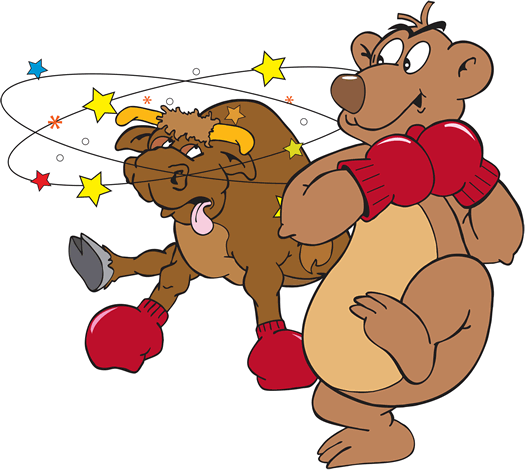 By learning trade false breakouts, also known as fakeouts, you can avoid getting whipsawed. 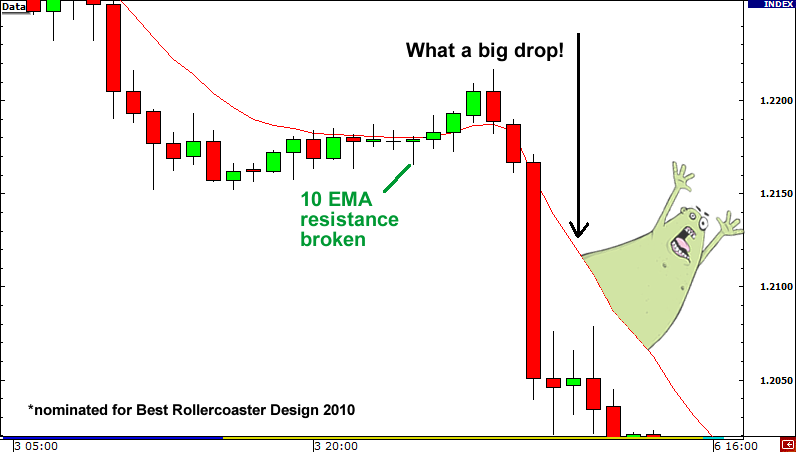 Trading breakouts appeal to many forex traders. Why? Support and resistance levels are supposed to be price floors and ceilings. If these levels are broken, one would expect for price to continue in the same direction as the breakage. If a support level is broken, that means that the general price movement is downwards and people are more likely to sell than buy. Conversely, if a resistance level is broken, then the crowd believes that price is more likely to rally even higher and will tend to buy rather than sell. Independent retail forex traders have greedy mentalities. They believe in trading in the direction of the breakout. They believe in huge gains on huge moves. Catch the big fish, forget the small fries. In a perfect world, this would be true. But the world is not perfect. Frogs and princesses do not live happily ever after. 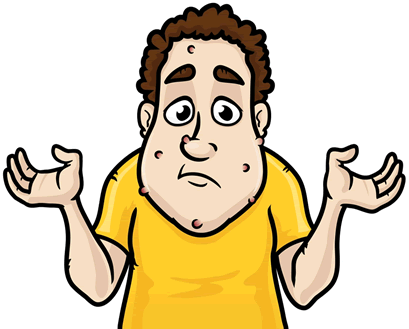 What does in fact happen is that most breakouts FAIL. Breakouts fail simply because the smart minority has to make money off the majority. Don’t feel so bad. The smart minority tends to be comprised of the big players with huge accounts and buy/sell orders. In order to sell something, there must be a buyer. However, if everyone wants to buy above a resistance level or sell below a support level, the market maker has to take the other side of the equation. 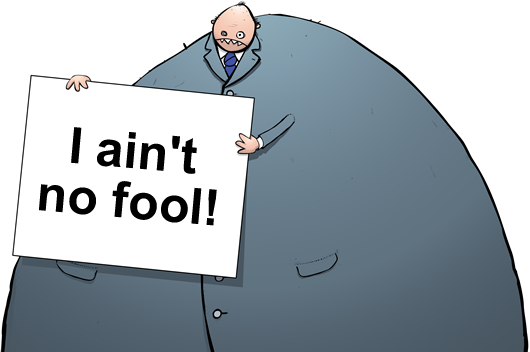 And let us warn you: the market maker ain’t no fool. Retail traders like to trade breakouts. The smart minority, the institutional, more seasoned traders, prefer to fade breakouts. The smarter forex traders take advantage of the collective thinking of the crowd or inexperienced traders and win at their expense. That is why trading alongside the more experienced forex traders could be very profitable as well. Which would you rather be part of: the smart minority that fades breakouts or the losing majority that gets caught in false breakouts? 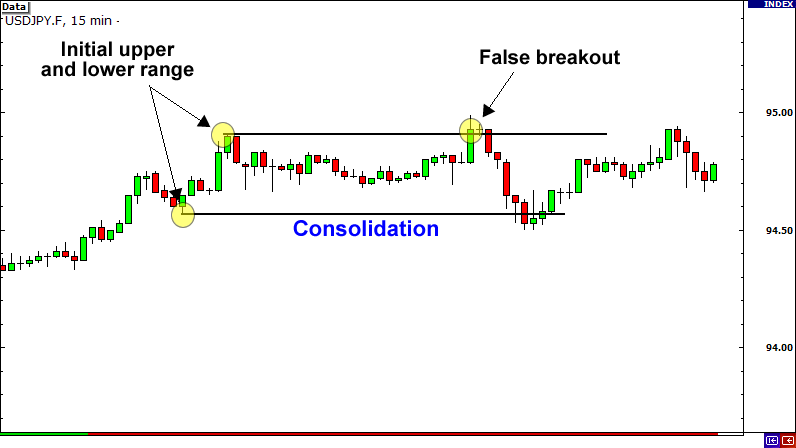 In order to fade breakouts, you need to know where potential fakeouts can occur. Potential fakeouts are usually found at support and resistance levels created through trend lines, chart patterns, or previous daily highs or lows. In fading breakouts, always remember that there should be SPACE between the trend line and price. If there is a gap between the trend line and price, it means price is heading more in the direction of the trend and away from the trend line. Like in the example below, having space between the trend line and price allows price to retrace back towards the trend line, perhaps even breaking it, and provide fading opportunities. The SPEED of price movement is also very important. If price is inching like a caterpillar towards the trend line, a false breakout may be likely. However, a fast price movement towards the trend line could prove to be a successful breakout. With a high price movement speed, momentum can carry price past the trend line and beyond. In this situation, it is better to step back from fading the breakout. How do we fade trend line breaks? It’s very simple actually. Just enter when price pops back inside. This will allow you to take the safe route and avoid jumping the gun. You don’t want sell above or below a trend line only to find out later that the breakout was real! 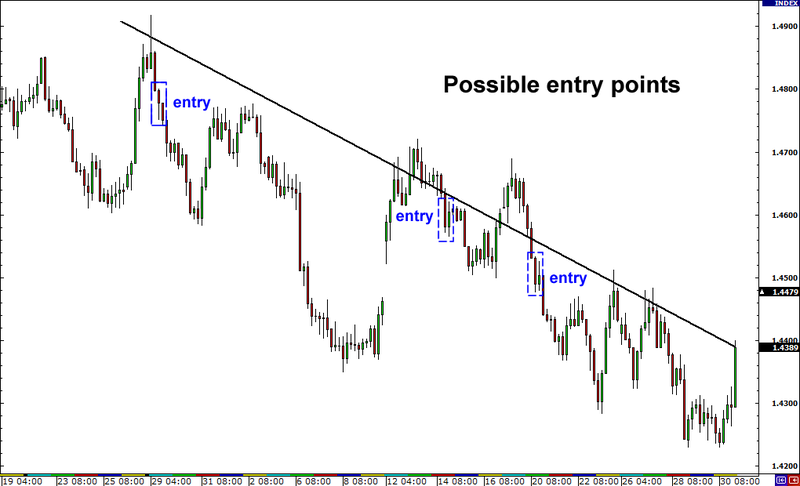 Using the first chart example, let’s point out possible entry points by zooming in a little. Chart patterns are physical groupings of price you can actually see with your own eyes. They are an important part of technical analysis and also help you in your decision-making process. The head and shoulders chart pattern is actually one of the hardest patterns for new traders to spot. However, with time and experience, this pattern can become an instrumental part of your trading arsenal. The head and shoulders pattern is considered a reversal. If formed at the end of an uptrend, it could signal a bearish reversal. Conversely, if it is formed the end of a downtrend, it could signal a bullish reversal. 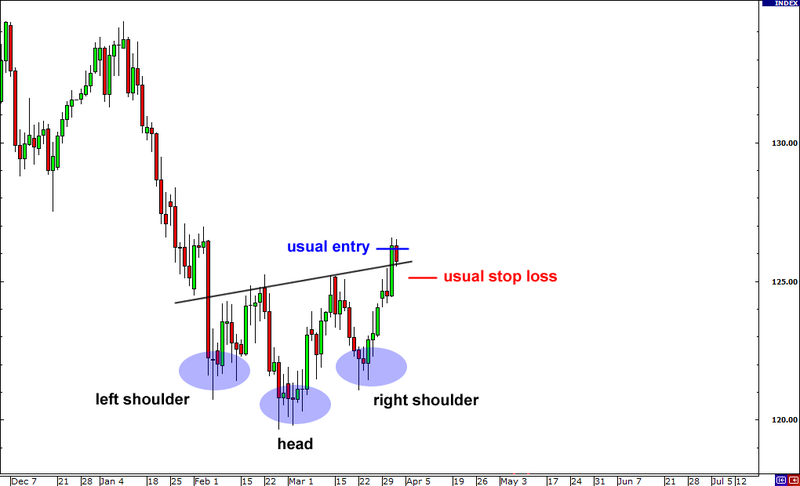 Head and shoulders are known for generating false breakouts and creating perfect opportunities for fading breakouts. False breakouts are common with this pattern because many traders who have noticed this formation usually put their stop loss very near the neckline. When the pattern experiences a false breakout, prices will usually rebound. Traders who have sold the downside breakout or who have bought the upside breakout will have their stops triggered when prices move against their positions. This usually is caused by the institutional traders who want to scrape money from the hands of individual traders. In a head and shoulders pattern, you can assume that the first break tends to be false. You can fade the breakout with a limit order back in the neckline and just put your stop above the high of the fake out candle. 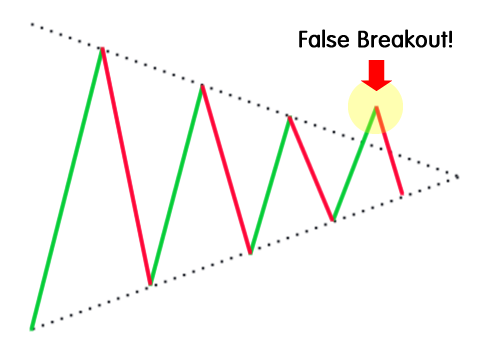 You could place your target a little below the high of the second shoulder or a little above the low of the second shoulder of the inverse pattern. The next pattern is the double top or the double bottom. 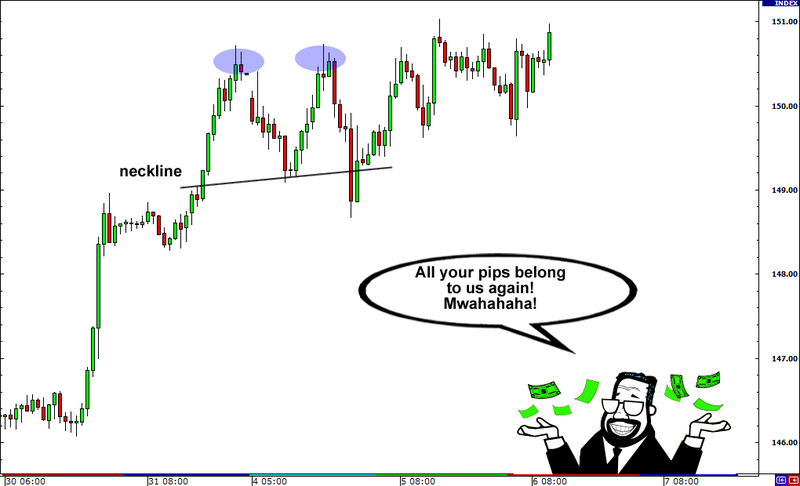 Traders just love these patterns! Why you ask? Well it is because they’re the easiest to spot! When price breaks below the neckline, it signals a possible trend reversal. 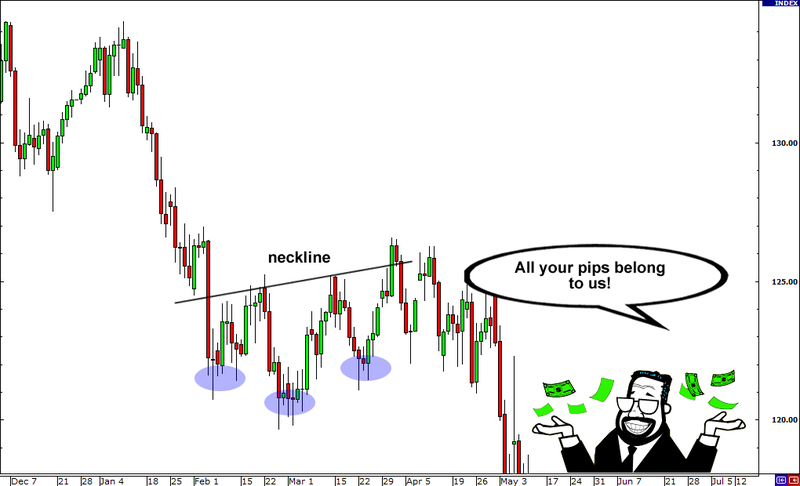 Because of this, plenty of traders place their entry orders very near the neckline in case of a reversal. The problem with these chart patterns is that countless traders know them and place orders at similar positions. This leaves the institutional traders open to scrape money from the commoner’s hands. Similar to the head and shoulders pattern, you can place your order once price goes back in to catch the bounce. You can set your stops just beyond the fake out candle. What kind of market should I fade breakouts? The best results tend to occur in a range-bound market. However, you cannot ignore market sentiment, major news events, common sense, and other types of market analysis. Financial markets spend a lot time bouncing back and forth between a range of prices and do not deviate much from these highs and lows. Ranges are bound by a support level and a resistance level, and buyers and sellers continually push prices up and down within those levels. Fading the breakouts in these range-bound environments can prove to be very profitable. However, at some point, one side is eventually going to take over and a new trending stage will form. 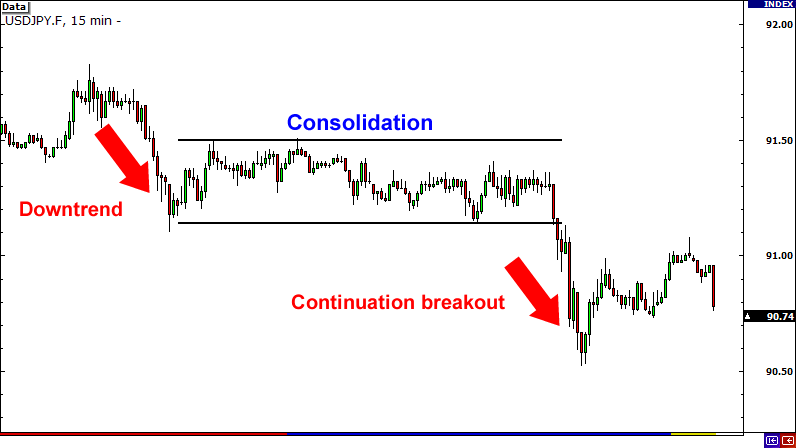 Breakouts are significant because they indicate a change in the supply and demand of the currency pair you are trading. You’ll notice that unlike trading stocks or futures, there is no way for you to see the volume of trades made in the forex. Because of this, we need to rely on volatility.Volatility measures the overall price fluctuations over a certain time and this information can be used to detect potential breakouts. There are a few indicators that can help you gauge a pair’s current volatility. Using these indicators can help you tremendously when looking for breakout opportunities. Finally, breakouts usually work best and FOR REAL with some kind of economic event or news catalyst. Always be sure to check the forex calendar and news before figuring out whether or not a breakout trade is the right play for the situation. Institutional traders like to fade breakouts. So we must like to fade breakouts also. Are you going to follow the crowd, or are you going to follow the money? Think, act, eat, sleep, and watch the same movies as these guys do. If we can trade in the same way the institutional players do, success is just a glimpse away. 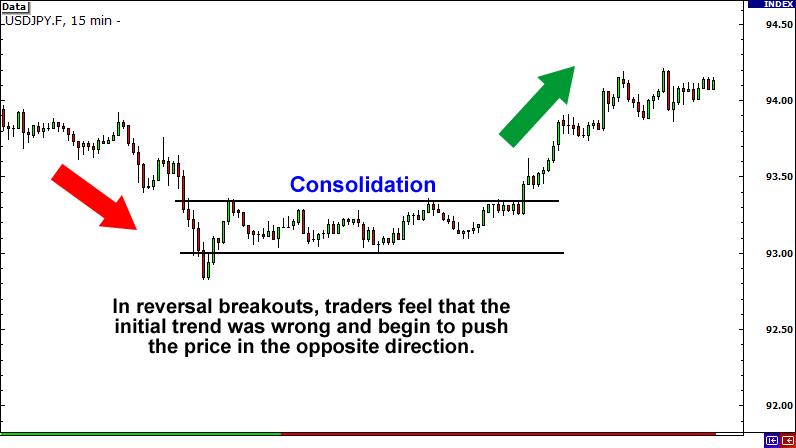 Fading breakouts simply means trading in the opposite direction as the breakout. 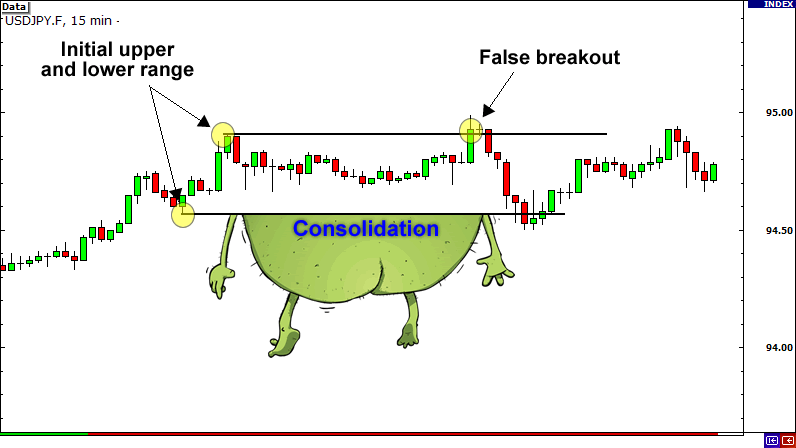 You would fade a breakout if you believe that a breakout from a support or resistance level is false and unable to keep moving in the same direction. In cases in which the support or resistance level broken is significant, fading breakouts may prove to be smarter than trading the breakout. Potential fake outs are usually found at support and resistance levels created through trend lines, chart patterns, or previous daily highs or lows. The best results tend to occur in a range-bound market. However, you cannot ignore market sentiment, common sense, and other types of market analysis. Finally, the odds of a fake out are higher when there is no major economic event or news catalyst to shift forex traders’ sentiment in the direction of the break. my time here at web, however I know I am getting experience everyday by reading thes fastidious articles. than that, that is fantastic blog. A great read. some good points in features also. I believe everything posted made a bunch of sense. 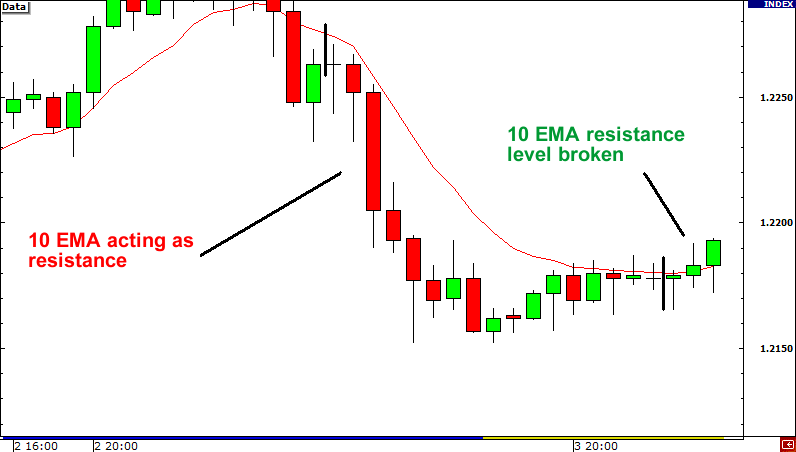 Metatrader MT4 Expert Advisor EA is kinda vanilla. get viewers to open the links. You might add a video or a picture or two to grab people excited about what you’ve got to say. It’s actually a cool and useful piece of info. I’m satisfied that you simply shared this useful info with us. I definitely savored every little bit of it and i also have you book marked to look at new things on your blog. I have been exploring for a ligtle bit for any high-quality articles orr blog posts on this sort off space . feeling I found out exactly what I needed. I most without a doubt will make certain to don?t disregard this website and give it a look on a constant basis. hi!,I like your writing so a lot! share we communicate extra about your post on AOL? The concept made its leap to the television airwaves every time a Dutch producer created the idea of placing a population group in a house free of any outside social influences. which can make the corporation extremely effective and competitive.